John and Horace Dodge were both machinists, when Henry Ford started the Ford Motor Company in 1903, the Dodge brothers machine shop built Ford’s engines. As part of the deal Henry Ford gave the Dodge brothers a one-tenth share in the Ford Motor Company, which the Dodge brothers later sold for $27,000,000 cash, the original capital for the Dodge Brothers Motor Company. This 1922 model, Serial # 731464, has been in this Swope family since 1952. 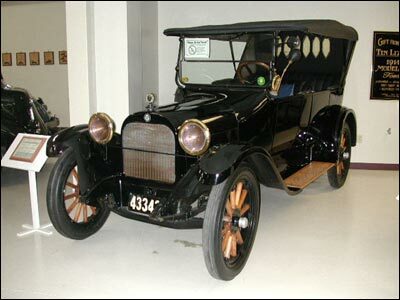 It is little changed from the original car produced by the Dodge brothers on November 14, 1914. The Dodge Touring car got its first big test as a military vehicle in 1916 when General John J. Pershing took six Dodges on his punitive expedition into Mexico while pursuing the bandit chieftain, Pancho Villa. The success of the Dodge in the rugged wastelands of old Mexico soon was a matter of US Military History, and the Dodge became the US Army’s first command car.